Reprint. Skipjack Press, 6 Laport Court, Ocean Pines, Berlin, MD 21811. ISBN No: 879535-17-3. $19.95 plus S & H.
Jack Andrews and Skipjack Press have done us all a favor by republishing this book in a large-size paperback. 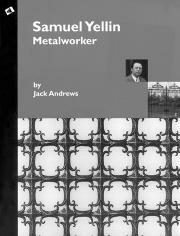 Samuel Yellin's work remains an important subject of study, not only for blacksmiths, but for artists, architects, interior designers, and anyone who works with or enjoys ironwork. Jack Andrews worked in the Yellin shops at Arch Street and is deeply familiar with his subject; his expertise shows throughout this book. Just the photographs of Yellin's amazing work is enough reason to add this book to your library. As usual, the scale of the works is sometimes overwhelming, and would require the labor of 50 smiths to execute. Those pieces are interesting to look at, but I like looking at the details. It is the details shown in these works - even the big ones - that can give you a myriad of ideas to try in your own shop. This alone makes this book a worthwhile purchase. But there is more than just that. Yellin's business practices are a lesson to us all, especially the way he documented all of his work. In a sense, this practice of Yellin's made books like this and the study of his work possible. He used job cards and took photographs of every piece of ironwork that went out the door. We should all document our work so well. Yellin's thoughts on design and the artistic nature of forged iron make great reading, as well. I keep going back to Yellin's discussion of Craftsmanship again and again, each time finding a new and interesting point to consider. When you add all this with the fact that this reissue costs $20, you have a real bargain. This book should be required reading for anyone with an interest in metals.